NEC has been associated with Solahart Australia since the late 80’s and over the past decade, Solahart has become a well-known solar water heater in many different applications from private households to hotels, hospitals, government institutions and many more. Although Solahart may not be the most competitive in terms of pricing, it does however differentiate itself from other products in terms of technical design differences. Solahart’s unique tank design with a double vitreous enamel ceramic coating, special thick pressure injected insulation, anode design as well as the Solahart specific collector design (36 multi riser) has left a footprint in Namibia which is hard to match. Namibia’s weather and water conditions are extremely harsh and demanding on systems, but Solahart’s design has proven to ensure a long term solution for the user. 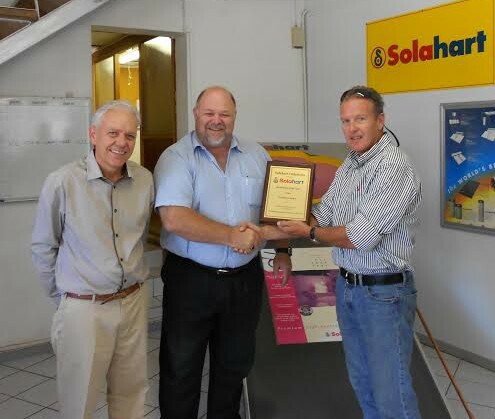 NEC Power & Pumps has been awarded the Solahart Excellence Award for 2012. Andreas Brueckner (CEO NEC group of companies) Vaughan Boultwood (Solahart Australia) Niko Brueckner – DirectorThe Solahart product basket we offer, caters for every application, whether it is the “traditional thermosyphone system”, the Heat Store Series II for bulk hot water supply (hotels, hospitals, hostels) and the Solahart E Series (pumped systems 150 – 1000 liter capacity). These systems are currently being installed in two multi-million government projects (Karibib Air Base and Leapards Valley / Oamites) Apart from promoting and installing Solahart solar water heating system throughout Namibia, the current demand for embedded Grid Feed Systems has increased substantially. The market and potential is huge out there and our contribution in catering for this demand this carrying a lot of fruit, eventually to the benefit of the user. These are exciting times we live in and we are proud and pleased to be part of an development that will change Namibia’s energy demand sector.